As a fashion critic, I’m always trying to reflect on why I respond to certain fashions with enthusiasm and joy whereas others have the opposite affect on me. One might argue that all of this comes down to personal taste, I believe signs of time, cultural influences and politics of life that underpin fashion should be at the forefront of our minds when trying to make sense of what we see on the runways or in the shops. In fact, it’s everything but fashion we should be looking at in order understand the meaning of this season’s pink, the appeal of the peplum skirt or why the moment for all things print has long past. 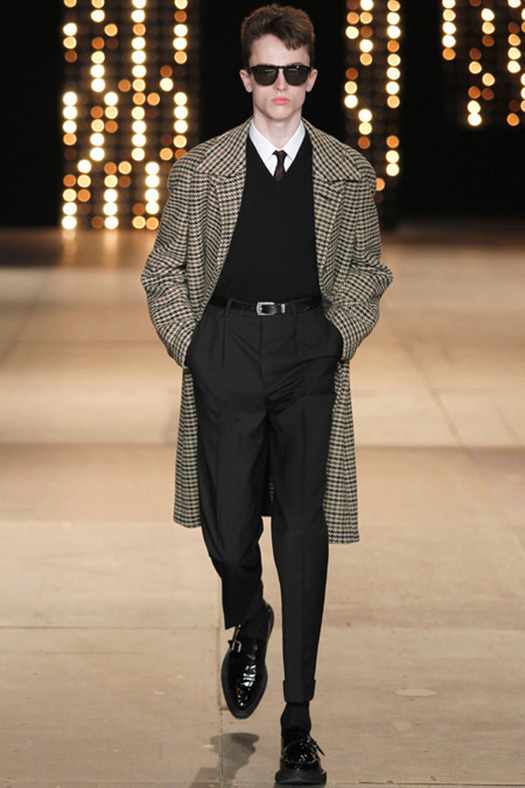 Whilst I adored Hedi Slimane’s work as the creative director at Dior Homme, a role he held between 2000 – 2007, I’ve never warmed to his new work at Saint Laurent. Despite the fact that he is following the same formula he established during his time at Dior: street casting models, clothing with deep roots in youth subculture style, narrow silhouette and close links with music, for some reason, it just doesn’t resonate with me anymore. Up until recently, I have dismissed my dislike of his new work down to the fact that I’m simply not anymore the customer he is after – too old and too fat probably. 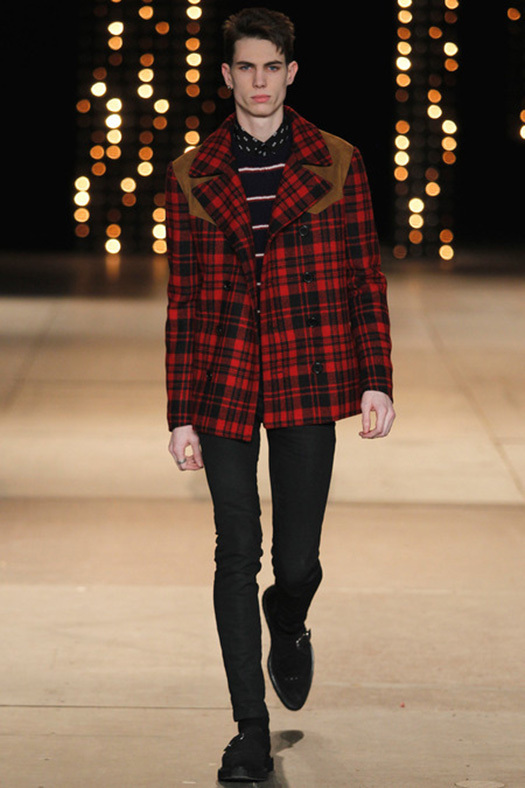 But whilst looking through the a/w 2014 menswear collection by Lucas Ossendrijver for Lanvin, followed by a browse through the latest Saint Laurent collection, it all started to make sense. 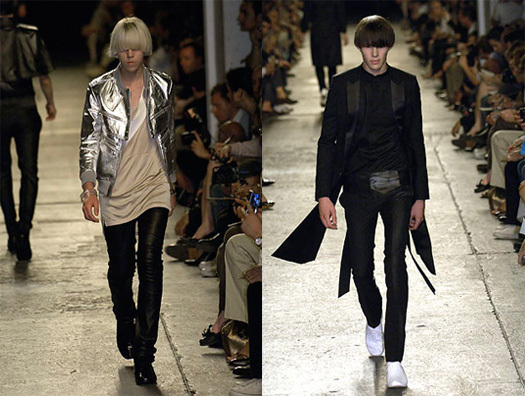 Both collections similar in attitude, approach and styling, had a one drastic point of difference. Where as Hedi Slimane was literal in the interpretation of past references, Lucas Ossendrijver take on the same codes was lateral in all accounts. Think back 10 years ago and cast your eyes across the landscape of fashion when designers such as John Galliano, Alexander McQueen and Hedi Slimane reined the scene. 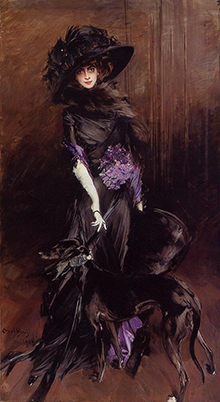 Galliano, at the height of his career, capturing the zeitgeist with his fantastical collections, took his audience on a trip with eccentric historical women such as Marchesa Casati[ref] Marchesa Casati by Giovanni Boldini (1908)[/ref] or Mata Hari who ignited his inspiration. At the same time McQueen was doing the same with collections inspired by the Elizabethan or Tudor Britain, a trademark historicism that he was known for. Perhaps less historic, more nostalgic of recent past, Hedi Slimane re-visited 1950s or 1960s youth culture and music scene see through the eyes of Jurgen Vollmer[ref] Rockers by Jurgen Vollmer[/ref] or 1980s New York via the window captured by Mapplethorpe. What all these designers had in common was their post-modern take on interpreting past references in a literal manner with contemporary updates – an approach that seemed relevant at the time. 10 years ago fashion business was very different to way it is now. The industry was going through a major reformation as the rag trade was gaining popularity though growing media coverage and access, partly provided by internet, partly because people began to realise the true power of fashion and the media spectacle around it. Because of this, runway presentations shifted up a gear – gone were the days when it was a closed environment for buyers and press as brands increased the production value of the shows to make headlines, allure people and to generate even more sales. And these new elaborate backdrops required even more elaborate actors in form of clothing. For this, designers frivolously ransacked past reference points that most of the time were matched with the mise-en-scène. It was all very successful and fun back then when trends were still relevant, there were only few dozen designers that mattered and fashion was perceived as novelty. In contrast, today no one cares about trends anymore, there are hundreds of designers to follow and our relationship with fashion is more complex than ever before. Whilst the fashion shows are still expanding in the spectacle value, the way in which designers think about the shows and creating collection has drastically changed. An array of young designers, who probably grew up admiring the likes of Galliano and McQueen are now ruling the runways. Their approach to design is different as reference points are more likely to come from Tumblr thinking – sort of random curation of visuals that only have shared aesthetics in common where connections are loosely created – than history book and trips to The Victoria and Albert or The Metropolitan Museum of Art archives for accuracy in historical reference points and realistic interpretations of part styles. What worked 10 years ago, seems now dated. Consider Gallino. Despite falling from the grace few years ago, towards the end of his time at Dior, the historical costumes seen on the runway started to feel tired. 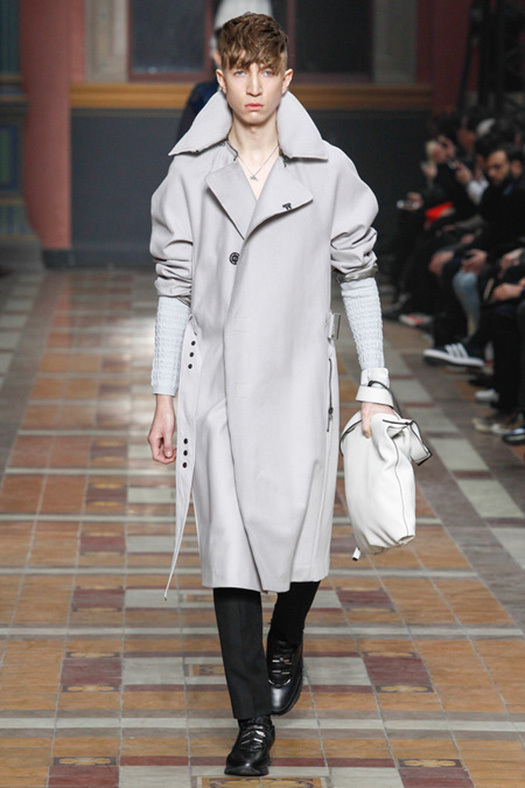 In contrast Raf Simons’ vision for Dior is fresh and contemporary, though not unfamiliar. Or look at McQueen now. In the hands of Sarah Burton, the label is finding its niche in the spectacular without the overworked historicism. Fashion is past being literal. 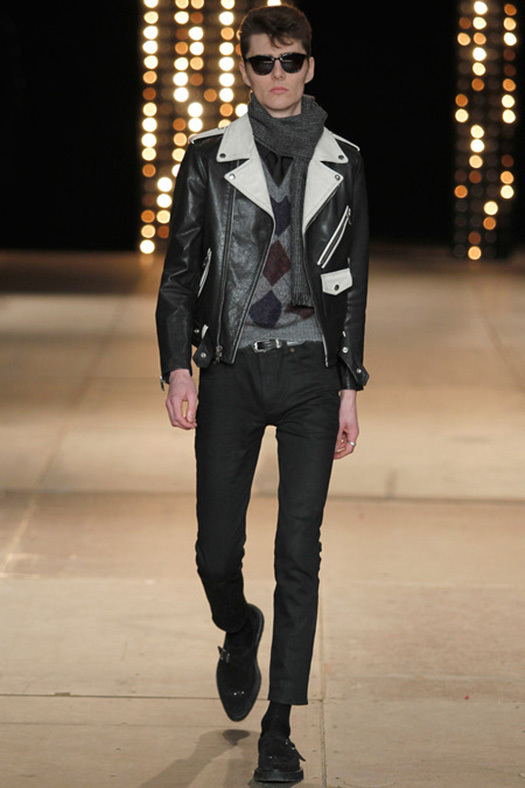 And it is because of this, why Slimane’s Saint Laurent feels so unexciting now. We’ve seen the collections already, and not just in vintage shops. We’ve made the same trips back to the past with him – and there is nothing interesting to see. 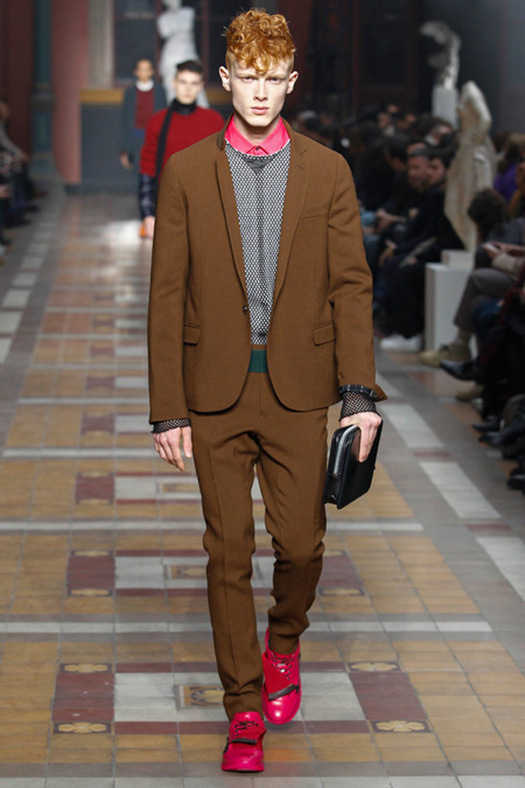 When deconstructing the looks from his a/w 2014 collection, whilst wearable and relatable in appearance, I see nothing note-worthy. 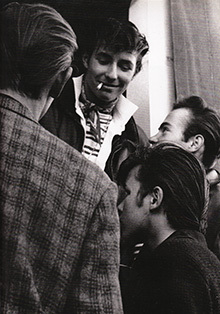 There is the lumberjack and the teddy boy, the glam rocker and the rock-a-billy, like a cast from Back to the Future with multiple stops back in time, trying to revive moments when kids just looked cool. 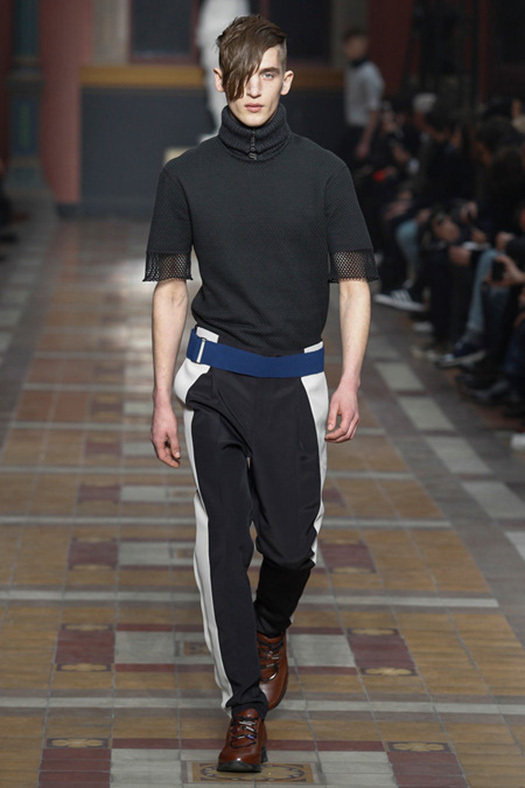 In contrast, look at Lanvin, in no way can you extract any re-enactments there. Though some garments appear familiar, the treatment they have gone through makes them new. The looks are eclectic in their appearance and forward thinking in their outlook. And anyway, there is something in the collection for everyone as it’s the variety with a strong signature that counts in today’s over saturated fashion market when trends no longer exist and no one wears looks that stretch from the tip of the quiff to the tip of the toes. 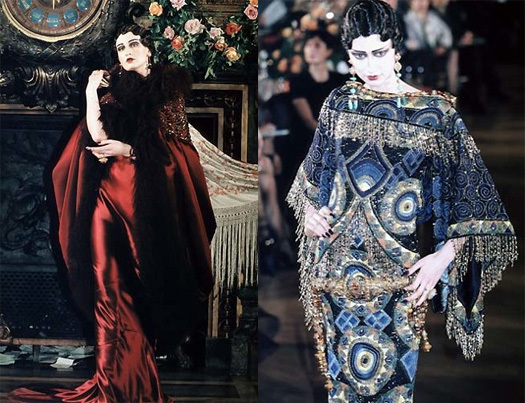 Time goes forward and with it, fashion evolves. Clothing doesn’t just change on the surface of the cloth with new fashions, moods and colours – our understanding and approaches to it alter alongside developments in the society and culture. It’s why we can identify movements in the arts, but fashion as well. Some designers adapt to the new (Lagerfeld springs to mind), some stubbornly stay the same (Paul Poiret famously diminished because his inability to move on with the times). With Slimane, the problem isn’t so much of him not knowing what’s happening, but him not translating it into shirts, pants, shoes and bags that give me a reason to what them. In fashion, all we want is newness, even if nothing really is new. What matters is that it appears to be new.